Rainfall and temperature are the most important environmental factors influencing crop growth, development, and yield. The northwestern (NW) part of India is one of the main regions of food grain production of the country. It comprises of six meteorological subdivisions (Haryana, Punjab, West Rajasthan, East Rajasthan, Gujarat and Saurashtra, Kutch and Diu). 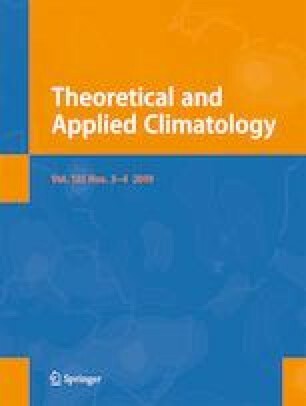 In this study, attempts were made to study variability and trends in rainfall and temperature during 30-year climate normal periods (CN) and 10-year decadal excess or deficit rainfall frequency during the historical period from 1871 to 2016. The Mann-Kendall and Spearman’s rank correlation (Spearman’s rho) tests were used to determine significance of trends. Least square linear fitting method was adopted to find out the slopes of the trend lines. The long-term mean annual rainfall over North West India is 587.7 mm (standard deviation of 153.0 mm and coefficient of variation 26.0). There was increasing trend in minimum and maximum temperatures during post monsoon season in entire study period and current climate normal period (1991–2016) due to which the sowing of rabi season crops may be delayed and there may be germination problem too. There was a non-significant decreasing trend in rainfall during monsoon season and an increasing trend in rainfall during post monsoon over North West India during entire study period. During current CN5 (1991–2016), all the subdivision (except the Saurashtra region) showed a decreasing trend in rainfall during monsoon season which is a matter of concern for kharif crops and those rabi crops which are grown as rainfed on conserved soil moisture. The decadal annual and seasonal frequencies of excess and deficit years results revealed that the annual total deficit rainfall years (24) exceeded total excess rainfall years (22) in North West India during the entire study period. While during the current decadal period (2011 to 2016), single year was the excess year and 2 years were deficit rainfall years in all subdivisions (except East Rajasthan) on annual basis.